Boland Athletics Mieke Basson, center, shined at the Oakland FAST Prestige Athletics Meet, at the Parow Athletics Track, in Cape Town, on Saturday. Photo by Keagan Mitchell. Bellville Athletics Club celebrated its 60th birthday in fine style by hosting a successful track and field meet, at the Parow Athletics Track, in Cape Town, on Saturday. The Oakland First At Sports Training (FAST) Prestige Athletics Meet saw athletes from all ages line up in their respective events, ranging from a brisk and exciting 5000m walk, to enthusiastic youngers wanting to impress, and those who wanted to kick off their season with a bang. Fans and parents packed the stadium which was a great motivation for athletes to perform to the best of their ability. 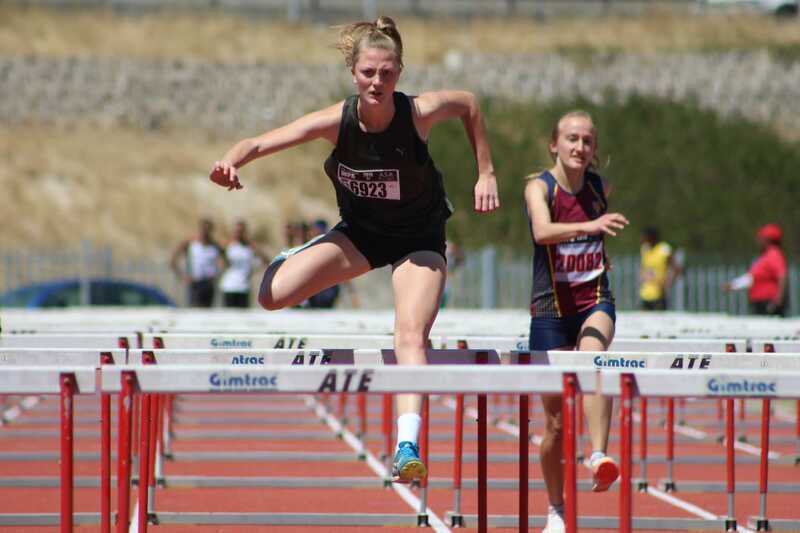 Among the stand out performances on the day was Boland Athletics Mieke Basson,17, who took gold in the girls’ under-18 100m hurdles and long jump events clocking 14.53 seconds and 5.83m. However, her time and distance won’t stand due to the wind reading being 3.4 and 6.5 metres per second which is over the legal limit of 2.0m per second. But either way she looked in good shape for a season opener. The Grade 11 pupil at Bloemhof Girls’ High School in Stellenbosch said she could have not asked for a better outing. “I was happy with my performances but there is always room for improvement. The plan for the season is to be consistent and to qualify for next year’s Athletics South Africa (ASA) Youth and Junior Championships,” she said. The youngster from Strand in Cape Town could have not asked for a better way to end her 2017/2018 track and field season after she finished second in the girls’ under-18 long jump event with a distance of 5.53m, at the African Youth Games, in Algiers, Algeria, in July. Basson also finished second in the girls’ under-18 long jump event and made the finals of the 100m hurdles at the ASA Youth and Junior Championships, in Paarl, earlier this year. “I was overwhelmed with emotions when I heard I made the SA team for the African Youth Games. It showed that all my work paid off. The African Youth Games benefited me in a big way and made me a stronger person,” said Basson who is also a brilliant hockey player after she helped the Boland under-16 team to third place at the inter-provincial schools’ tournament, in Bloemfontein, last year. In other action, Gideon Cillie who took gold at the ASA 50km Race Walking Championships & Inter-Provincial in the 20km masters men 40-44 category last month followed that up with another gold in the men’s 5000m walk clocking 23mins50secs. The current boys’ under-12 SA schools’ 100m and 150m sprints champion Dwayne Minnies continued his fine form by taking first place in these events. Meanwhile Reece Montsumi who took gold at the SA High Schools’ Championships had to settle for second place following Gratias Mukiapini winning jump of 1.90m.While the bronze medalist in the high jump event, at the World U20 Championships, Breyton Poole took the gold medal in his respective age group(under-20) with a height of 2.10m.